Comm Eye Health Vol. 19 No. 60 2006 pp 66 - 67. Published online 01 December 2006. CBM VISION 2020 Support Programme Co-ordinator, PO Box 8426, Anglo Jos Plateau State, Nigeria. Community-directed treatment with ivermectin (CDTI) is the main strategy of the African Programme for Onchocerciasis Control (APOC). It has enabled the programme to reach remote and underserved communities where onchocerciasis is endemic. With CDTI, the community is involved in key decisions about how the drug is distributed and selects the distributor. In this way, a relationship of trust is established between provider and beneficiary. This provides an entry point for expanding activities dedicated to the prevention of blindness. Christian Blind Mission International (CBMI) began working with the government of Nigeria in 1995 on their onchocerciasis programme. In 2003, this collaboration was broadened to address the prevention of blindness. The structure provided a way to reach the people living far from eye care facilities (in many states, these facilities exist only in the urban centres). In addition to strengthening the eye care services, efforts were made to create awareness and a demand for cataract services amongst rural dwellers. The programme described in this article aims to organise outreach programmes in northern Nigeria and falls within the authority of the Ministries of Health of the states of Kano, Jigawa, Yobe, Taraba, and the Federal capital territory, Abuja. In each state, at least one outreach activity is held every year. Each state chooses a suitable site to reach as many people as possible. In 2004, a total of 632 eyes with blinding cataract were operated; this figure increased to 768 in 2005. 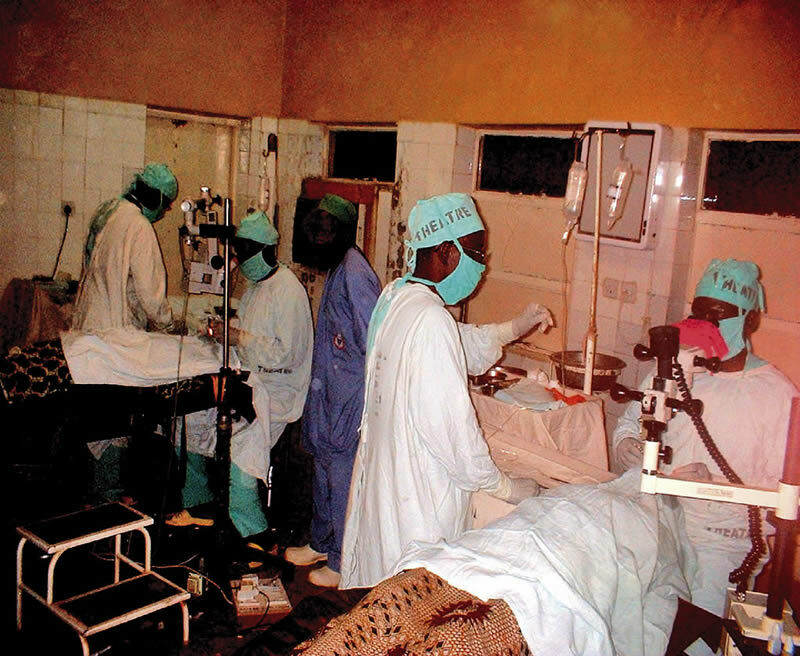 In 2006, between January and July, 1,920 eyes with blinding cataract have been operated. In all these cases, an IOL was inserted. During these outreach camps, trained ophthalmic nurses also attended to trachoma trichiasis patients. This supplements the regular eyelid surgery camps organised by the states. More than 500 eyelids with trachoma trichiasis were operated in 2005. All the patients operated during outreach activities are reviewed at the site of the outreach. They are asked to return to the clinic one week after discharge, and again after six weeks. If there is any problem, they are asked to return immediately. Similarly, if the patients run out of medicines, they are advised to go to the clinic and not to wait for the appointed date. In certain cases, the ophthalmic nurse travels with the patient from his or her area to ensure proper follow-up. The CDTI structure is used for the distribution of ivermectin (Mectizan®) drugs to all community members in the endemic areas. Since the distributors are volunteers selected by the communities, and reside within the communities we found that, with additional training, they could take on additional responsibilities. They attended a two-day primary eye care training programme, including one day of field practice, on how to recognise and refer preventable or curable eye diseases prevalent in the communities. reminding the clients to go back for periodic review (post-operative care). plan annually for regular and consistent visits to outreach centres. participate in all activities before and during the outreach. provide for their own subsistence over the number of days they will spend at the surgical camp site. mobilises volunteers for crowd control and to assist in carrying patients to and from the theatre. allowing their houses to be used by the entire team. affordability of services so that no willing client is denied the services. Patients are expected to pay some amount for the cataract services that they will receive, which will depend on the cost-sharing formula chosen for a particular outreach. In determining the cost that patients are to pay, consideration is given to the very poor, poor, and rich patients. In most cases, the majority of beneficiaries are poor. This makes it very difficult to establish a dividing line to categorise or segment the payment. Subsidy is provided across the board to enable patients to take up the services. In a few instances, full sponsorship helps very poor patients to benefit from the operation free of charge. We have noticed some positive developments arising from outreach activities. For example, states are identifying personnel to be trained as ophthalmologists, so as to fill this gap in human resources. In several states, individuals and organisations have sponsored cataract surgery camps for the benefit of community members: in 2005, more than 500 cataract blind patients were beneficiaries under such gestures. free eye camps threatening the sustainability of permanent eye hospital services. How have we coped with these challenges? Firstly, an advance team from the VISION 2020 Support Programme arrives at the camp venue to ensure that adequate mobilisation and effective arrangements are made before the arrival of the surgery team. Secondly, plans are underway to procure a stand-by portable generator to complement the ones provided by the states during eye camps. This case study demonstrates how eye care services have been extended by using the entry point of an existing prevention of blindness infrastructure. This was facilitated by a productive relationship between the state government health authorities and an international organisation.